a half-hour. Thus, when Hanna-Barbera's Huckleberry Hound debuted in 1958, he debuted alongside Yogi Bear and Pixie & Dixie; and when their Quick Draw McGraw started in 1959, he had Augie Doggie and Snooper & Blabber as back segments. And so, Total Television's King Leonardo had a couple of "short subjects" as well — The Hunter (a detective spoof with a bloodhound for a star) and this one, Tooter Turtle. Tooter's segment consisted of simple homilies, the moral of which was "There's no place like home". Each episode, he'd call on his friend, Wizard the Lizard (whom he addressed as "Mr. Wizard") and request a transfer to some fun past setting he'd been reading about. Then Wizard would use his magic to send Tooter there, and Tooter would find out it it wasn't so much fun after all — in fact, it would usually turn out downright painful. When he'd had enough, he'd cry out for Mr. Wizard to rescue him; and with the words "Drizzle, Drazzle, Drozzle, Drome, Time for this one to come home", Wizard would immediately do so. He also, in his German accent, dispensed the advice, "Be what you is and not what you is not! Folks that is what they is, is the happiest lot!" Tooter always promised to show better judgment in the future, but he never did. Like Leonardo and Hunter, Tooter debuted on NBC, on Saturday, October 15, 1960. His voice was done by Allen Swift, who had played a late Terrytoons character, Clint Clobber. Mr. Wizard was Sandy Becker, who also did a couple of voices in Go Go Gophers (one of the back segments of Underdog's). The show ran two years. 43 episodes were made. Tooter never had any Little Golden Books or Big Little Books, and his only comic book appearances were a few stories in the backs of the ones Dell and Gold Key published about King Leonardo. There were a few toys and such, but not an avalanche of merchandise. The cartoons themselves, tho, did continue to show some vitality. King Leonardo & His Short Subjects was rerun for years, syndicated under the title The King & Odie. And Tooter's segment was resurrected years later as back-up to Tennessee Tuxedo. It's been many years, tho, since they were seen. 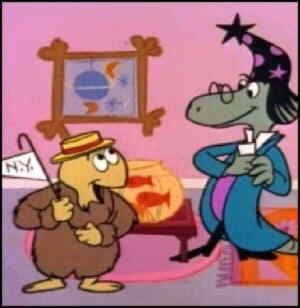 Mr. Wizard, with his German accent, is still remembered very well, as is his familiar incantation ("Drizzle, Drazzle", etc., tho usually with a minor variation or two). Tooter himself is remembered too, but his name is often spelled "Tutor". Text ©2003-07 Donald D. Markstein. Art © Leonardo Productions.